A few weeks ago I posted about Retro Inspired Kitchens, so I thought it would be fun to show you some retro inspired bathrooms as well. 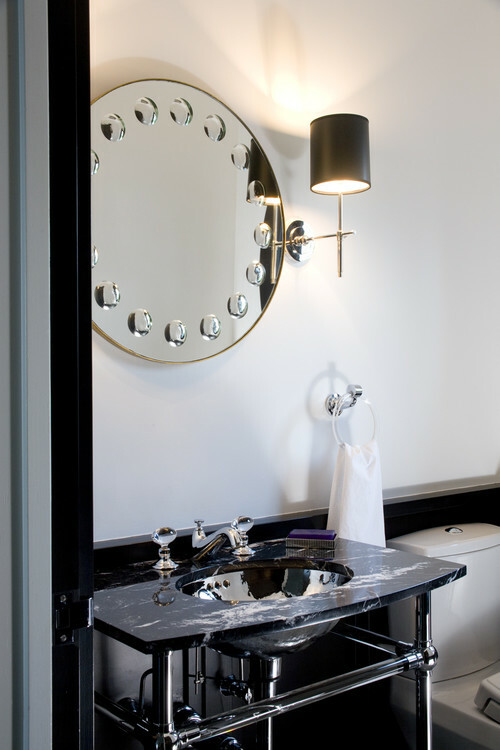 These can be a lot more tricky than kitchens, because very often bathrooms in older homes are small and because of the space constraints, a lot of people use pedestal sinks which are great, but can leave people wanting for some counter space. It's completely possible to get a great retro vibe, conserve space, and get some room to work and store things all at the same time. With so many fun tile products on the market right now, a good way to go is to use tile for the fun part of your project and keep the stone or quartz part a little bit quiet. This bath uses white quartz with a thick mitered edge to produce a clean and sleek vanity. 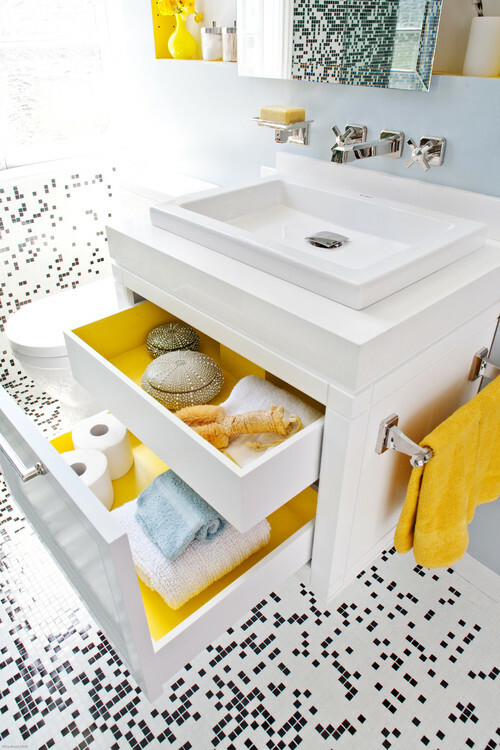 As a side note, how much do you love the fact that the insides of the drawers are painted yellow? 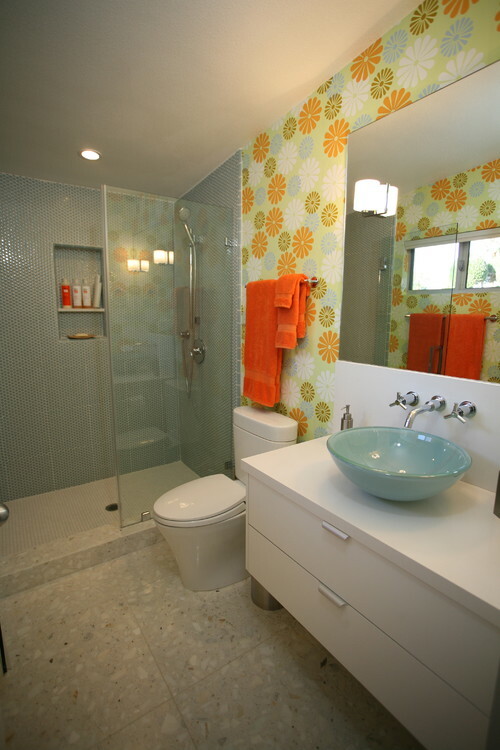 This bathroom also uses tile to give the retro vibe while staying neutral and timeless. 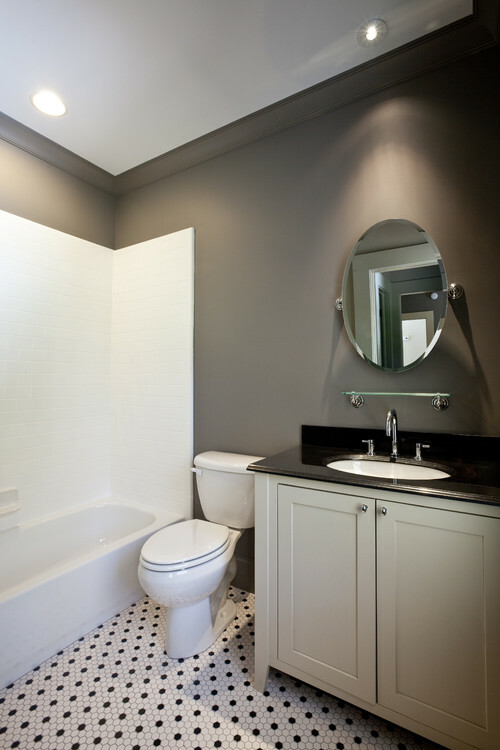 The Absolute Black granite is perfect against the grey painted wall and the black and white hex tile on the floor. 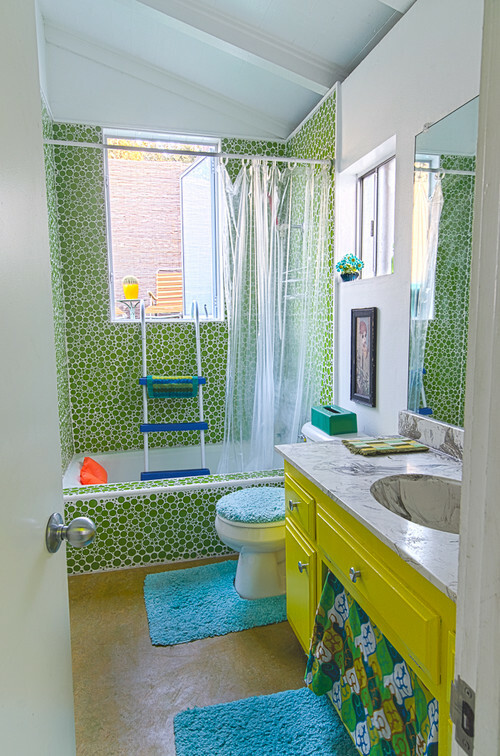 This is another example of how other finishes like penny round tile (in the shower), terazzo (on the floor), and bold funky wallpaper (!!!) give the retro feel to the space while the counter tops stay plain and simple. I don't feel like some spaces need to be described. This bathroom belongs to the owner of a fantastic shop in Long Beach, CA called In Retrospect and I don't think there could possibly have been a better way to bring the 1970s into the 20-teens than this.